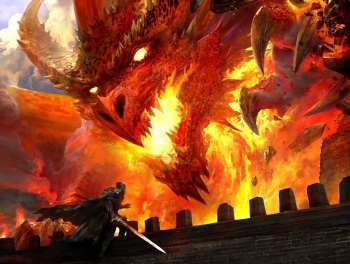 The public playtest for the next iteration of Dungeons & Dragons begins today, May 24th. Mike Mearls is the head of the development team tasked with recreating the rules for the most iconic tabletop fantasy roleplaying game after the 4th edition unfortunately led to a fracturing of the game's core audience. That's no easy feat, and the goal is to attempt to appeal to as many gamers as possible through a lengthy public playtesting period. You'll have the chance to play a version of D&D Next - as Mearls and company still call this new edition - and offer suggestions on how to improve the rules. Download the playtest rules for D&D Next here. This week, I got Mearls to divulge his strategy for rolling out the playtest, what new rule he's most nervous about, and why he chose to write rules which concentrate on how your character behaves rather than how much damage he or she can deal. Greg Tito: What are your goals for digital distribution of the Playtest Rules? How often will we see updates? Mike Mearls: We want to get the playtest out to as many people as possible, so having a digital method of distribution allows us to do that. Plus, it helps make updates to the materials much easier. Once the playtest has begun, we will be balancing between taking in feedback, revising content and, of course, working on new content. You can probably expect to see new material come through over a matter of weeks, but it all depends on how smoothly our process goes. Greg Tito: How will you be shown the data from the playtest feedback? Will it be based more on hard numbers or anecdotal evidence? Which will you rely on more? Mike Mearls: We'll use surveys as our primary method to collect quantitative feedback and help us to make some of our larger decisions and revisions. We'll also be relying heavily on Live Chats, forum discussions and playtesting at key events, though, to gather more of the qualitative feedback. It's important to us to give players as many outlets as we can to tell us their thoughts and visions for the game. Greg Tito: Why has it taken so long to implement the modularity or diversity of play that was a part of your initial design goals? Mike Mearls: Most of our time has been dedicated to analyzing the initial player feedback and building a robust, core game. It's all well and good to have a modular game, but if the game changes in ways that are irrelevant to players and DMs, then it's simply useless noise. It's important that we get a lot of feedback from players, because that will help us figure out where to focus our modularity. Going back to Hit Dice and the mechanical change it represents, that's precisely the kind of area where we can introduce options for DMs to use, rather than dictate a canonical model of play. On top of that, it's critical that our core system functioned smoothly and with complete clarity. If the core game is hard to untangle or has lots of moving parts, it will be hard both for designers and DMs to figure out how to modify those things and what those changes might actually do. We've put a lot of work into the core game, and our initial playtest focuses on that. Greg Tito: What part of the D&D Next rules are you the most nervous about receiving a bad reaction from fans? Mike Mearls: The Hit Dice rules really stand out, because they touch on an area of the game where people have very different opinions. In the current rules, Hit Dice represent your character's ability to recover from injury through mundane means. Between fights, you can spend them to heal provided that you have bandages and similar gear. I know that some players really like extra healing so that they can keep adventuring without worry about resting too often. Other players feel that such resources are too unrealistic and don't fit in with the feel of D&D. In this case, we've taken care to isolate the Hit Die mechanic. It exists on its own and would be trivial for us (or an enterprising DM) to remove. It's something we'll watch in our surveys and feedback to get a sense on whether D&D players see it as a step forward or a step back.